The true story of British War correspondent Marie Colvin leading up to her death in Homs Syria during the 2012 bombings. Ever since Rosamund Pike (Hostiles (2017)) absolutely nailed her performance as Amy Dunne in David Fincher’s Gone Girl (2014), I feel like I’ve watched her career a little more closely. Since her Oscar nomination for the role previously mentioned, Pike has made some interesting choices on which projects she has involved herself in. Before Gone Girl, Pike’s best-known role was probably Miranda Frost from the laughably bad Die Another Day (2005), but now her career path has shifted slightly, and I’m a big fan of that change. She’s tackling more intense indie roles like Hostiles (2017), Beirut (2018), and this film. The change suits her; she plays a strong female lead extraordinarily well, and I’m interested to see what the future holds for her. This is a good movie, with just a few scenes and choices that hold me back from calling it a great one. 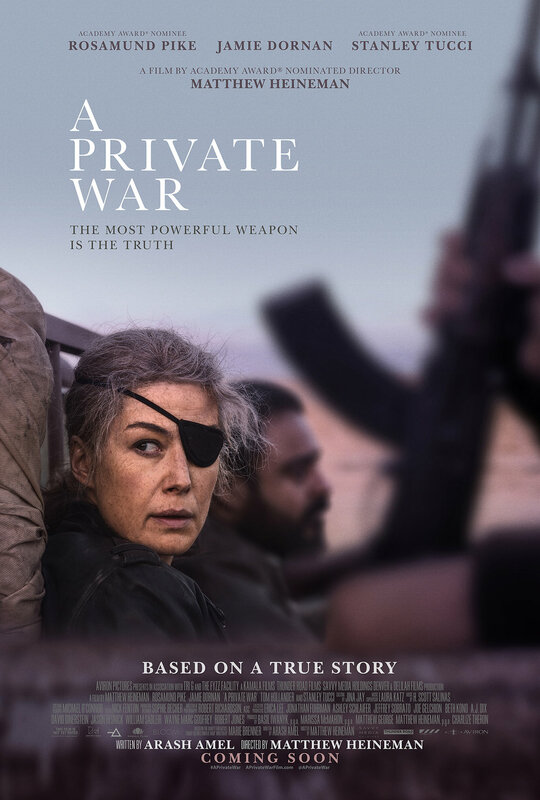 This movie is based on a real life war coreespondant, Marie Colvin, whose life ended only six years before this hit theaters. Her death is fresh, still as painful as an open wound for those that knew and loved her. It wouldn’t have been unreasonable for a loved one to want to get their hands on the script before it was written, alter some details, and in a sense, glorify that who she was. We see it all the time in popular films based on pop icons or historical figures; just look at recent Best Picture nominee Bohemian Rhapsody (2018) and the way that Freddy Mercury, in a sense, can do no wrong in that film. Yes, he makes mistakes here and there, but there are never any real, life-altering consequences for the turmoil he caused in the lives of his wife and band members. In this film, the movie doesn’t go out of the way to paint Marie Colvin as a likeable character; she was a drunk, she could be reckless, she had issues keeping a steady romantic partner, and she had a crippling, almost debilitating, case of PTSD that haunted her to the end of her days. She was portrayed a troubled person, but she was a living, breathing, thinking, caring, paradoxically-filled person; not a glorified icon made out to be some flawless infinite source of wisdom and joy. For that I give this movie a lot of credit. Rosamund Pike was the reason I watched this film, and she was wonderful in this. 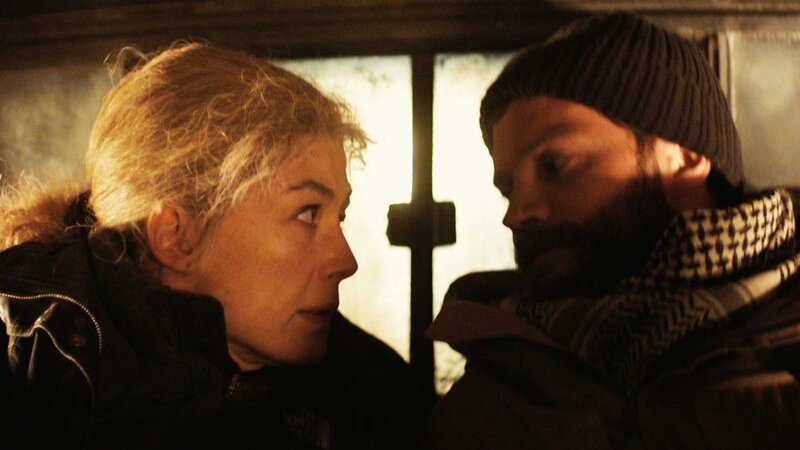 There were intense scenes where it felt like we were listening to Marie herself talk (you can go back and listen to some of the interviews she gave on CNN or BBC- you can even see Anderson Cooper’s reaction to finding out Marie died after their conversation). There were only one or two scenes where I felt her performance was a little off, those scenes being the surrealistic PTSD dream-sequences, which, as a whole only partially worked for me throughout the film. The PTSD-ridden dream-sequences were, in my opinion, a crutch to tell Marie’s story. We get the fact that seeing all of these horrible incidents had driven Marie to a life of alcoholism, and that some of the things she saw really stuck with her in ways we couldn’t even begin to understand. We really didn’t need the dream sequences; they looked sort of cheap compared to the rest of the film. I thought Rosamund did a great job of portraying that sense of paradox that was Marie; she seemed to chase stories with wild abandonment, but at the same time have a wild thirst for life, and that’s the sort of personality that only comes from leading a life that trills between notes of chaos and order. That sort of life can obviously lead to some frayed nerve-endings; the human body is resilient in some ways, but in Marie’s words, (I’m paraphrasing because I can’t find the actual quote) “Once you see how easily bits of hot metal can render human bodies into chunks of pulpy flesh and gore, you can’t unsee it.” Her life was hard, and the way she lived it was hard, but her work was undeniably important; Rosemarie does a great job of not sugarcoating the bitter and ugly parts of her personality. I was actually kind of impressed with Jamie Dornan (Robin Hood (2018)) in this movie too. I’m rather unfamiliar with his work; I know he was cast in the Fifty Shades of Grey (2015) series, but believe it or not I never had any interest in seeing those… Unfortunately with rising Hollywood stars, they can oftentimes get pigeonholed by roles that brought them fame: Leonard Nemoy with Spock, Kristin Stewart (Clouds of Sils Maria (2014)) and Robert Pattinson (Good Time (2017)) still get bad raps from their roles in Twilight (2007), Daniel Radcliff still gets asked about Harry Potter in every one of his interviews… So it’s no wonder that I found myself falling into that category of pre-judging actors when I heard about Jamie Dorman. ‘Fifty Shades!’ I thought to myself, ‘What self-respecting actor would be in that drivel?’ Well it turns out Dakota Johnson (Suspiria (2018)) is amazing in pretty much everything, and Dorman can act too. Tom Hollander (Bohemian Rhapsody (2018)) keeps popping up in movies I’m watching nowadays. He gives a very solid performance as well. Stanley Tucci (The Lovely Bones (2009)) was Stanley Tucci. I really liked the way that this story was approached as well. The movie details several stories that Marie broke and the impact that those individual stories had on the region in which they were reported, and also the global impact. In showing us these stories she broke in relation to the tragic life Marie Colvin lives, it gives us a balanced look at everything she was; her body of work as well as her struggles, personal issues, and triumphs. As far as modern biopics go, this is a very good film. As I said above, it falls short of great due to a few scenes, but it is absolutely worth watching. Rosamund is the reason to watch the film, but the story it tells is one that needs to be heard.